Which Melbourne Building Would You Buy to Live In? You can live anywhere around Melbourne - where to choose? If money was no object, which Melbourne building would you buy to live in? The Old Treasury Building at duck. 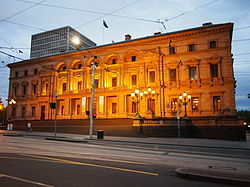 It is certainly true that there are some amazing buildings around Melbourne. Some quirky, some large, some small, some in between and certainly some for the adventurous. Some people would choose to live on top of a mountain overlooking a wonderful view, others may prefer to live by the seaside. Others would move to a beautiful valley location. Let's say you came across an enormous amount of cash and you could buy any Melbourne public building to live in, which one would you choose and why? If you are after a really cool location for hot summer nights, the Shine of Remembrance could be interesting. Of course, you may have to battle some night-time ghosts and visitations. So perhaps you may prefer to move across the road and move into the pavilion at the Royal Botanical Gardens. You would certainly wake up with a beautiful view every day. What about the top of the Rialto Tower, with its clear glass bottomed floor - certainly one for the adventurous. I always like the lofts at the veggie bar on Brunswick Street and think they would make a pretty cool bedroom in a great street location. If you suffer terribly from the heat over summer what about purchasing the Chill On Ice Bar, that would certainly be a cool place to spend some time. Perhaps you prefer to become at one with the ocean. If so, maybe the Melbourne Aquarium would be the next best thing for your viewing pleasure whilst in bed. Liking my luxuries a little too much at times, I think I may prefer one of the fancy hotels that has a buffet breakfast on hand and high tea. Of course, I would have to ensure that the staff came with the building. It can be any public or privately owned building in or around Melbourne. Which one do you choose and why - please add your notes in the comment section on this page.